Welcome to the beginning of Perfect Game's 2018 College Baseball preview content presented by Rawlings. This is the first of many features between now and the beginning of the season, Friday, February 16. From the Preseason All-Americans, top prospects by class, initial rankings of the Top 25 teams and detailed conference previews, Perfect Game will have you covered. The Perfect Game/Rawlings Preseason All-American teams consist of 17 players each, with three full teams listed below, including detailed reports on all of the players listed on the first team. The players are selected based on a balance of past performance, 2017 expectations and their prospective talent relative to the MLB Draft. Special thanks to 2080 Baseball for allowing Perfect Game to use several of the video clips included in the montage. View their extensive 2018 MLB Draft video library here. With some catchers you see a sacrifice in offense in return for high-end defense, or a potent hitter who’s a passable defender. 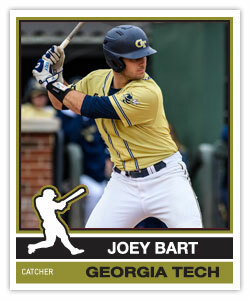 What Georgia Tech has in Joey Bart is a true talent on both sides of the ball with the physically gifted, 6-foot-3, 225-pound backstop. Armed with a plus arm behind the dish, which immediately thwarts an opposing team’s basestealing intentions, Bart is a sound all-around talent defensively with ever-improving receiving skills. His big righthanded power is a second plus tool and it’s one that plays in games as evidenced by his 13 home runs during the 2017 season, as well as his 13 doubles. The combinationa of his defensive skills and big-time bat speed and strength will make Bart a premier hitter in the ACC and possibly the first catcher to come off the board in the 2018 MLB Draft come June. You’ll have to excuse Seth Beer for enjoying the most impressive “down” season possibly in the history of college baseball, hitting .298-16-53 in 2017 after his sensational Freshman Player of the Year season. 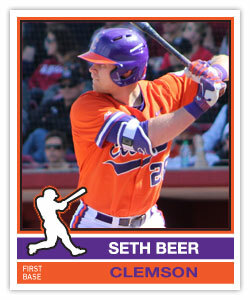 Beer poses one of the toughest at-bats for opposing pitchers while serving as the heart and soul of a potent Clemson lineup, as he walked more than twice the number of times he struck out in two seasons (126 to 62) and has also hit 34 home runs with 123 RBI during that time. As a lefthanded hitter he gets great extension and clearly knows how to wait for his pitch, with a knack for hitting the ball hard. For as exciting as his offensive profile is, there is some question as to where he’ll land defensively, and could split time between first base, left field and designated hitter both as a junior and moving forward as a pro. Madrigal plays much bigger than his listed 5-foot-8 frame, with frequent comparisons to Dustin Pedroia. Madrigal has a heightened sense, and overall feel, for the game, which always makes it seem as though he’s one step ahead of everyone else. The quickness in both his hands and feet help him in every facet of the game, making him a plus defender and baserunner with the ability to make consistent hard contact to all fields. There is a surprising amount of pop in his bat as well, and after hitting .380-4-40 with 16 stolen bases as a sophomore on his way to earning Pac-12 Player of the Year honors, Madrigal is one of the favorites this year to finish the season with the Golden Spikes Award. 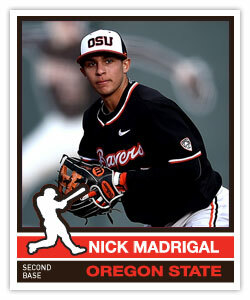 A return trip to the College World Series for Madrigal and the Beavers could go a long way in securing that feat. Just how good has Bohm been for head coach Todd Butler and the Shockers since arriving on campus? The 6-foot-5 power slugging third baseman went from undrafted out of high school to a potential first round pick in this upcoming June’s draft. All he’s done since arriving is perform, most notably with the bat as he’s hit .303 and .305 respectively over his first two years. Add in an uptick in power production as he connected for 11 home runs as a sophomore in 2017, with a near 1-to-1 strikeout-to-walk ratio, and followed that up with a .351-5-28 summer season in the Cape Cod League. 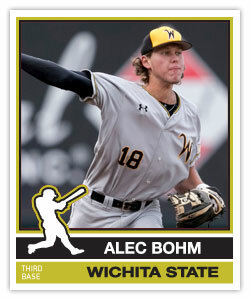 One of the premier bats in college baseball, Bohm and Second Team Preseason All-American Greyson Jenista give Wichita State a true “Bash Brothers” feel to the middle of their order and should boast one of the nation’s top offenses as a result. 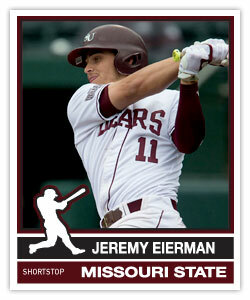 After playing alongside 2017 first-round pick Jake Burger on the left side of the infield for Missouri State, shortstop Jeremy Eierman has the chance in 2018 to truly make a name for himself. While Burger drew many of the headlines last season Eierman finished the year with more homers (23), RBI (68), total bases (164) and extra-base hits (40), while also stealing 17 bases and finishing with fewer errors (10) at a premium up-the-middle position. The tools match the production, as Eierman is also considered a potential first-round pick as the 2018 draft approaches with a near five-tool profile. No team is going to overlook Eierman and the Bears this season after they beat Arkansas twice in three games, in Fayetteville, to advance to the Super Regionals where they fell to TCU just a step away from Omaha, with Eierman playing a big part of that success. 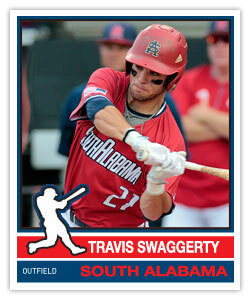 South Alabama has reached Regional play each of the last two years, and outfielder Travis Swaggerty has played a big role in that success. While he’s not the most imposing figure at 5-foot-11, 180-pounds, he has five solid tools that all rate in the 50-55 range on the 20-80 scouting scale, with his speed topping out as the best of those tools. After an impressive freshman season, Swaggerty slashed .361/.487/.567 with 19 stolen bases as a sophomore and his power in particular took a significant step forward, hitting 10 home runs after belting four in 2017. He followed that up by hitting .328 for Team USA over the summer, and with another big season he could draw more and more comparisons to current Boston Red Sox and former Arkansas Razorbacks outfielder Andrew Benintendi given his size, lefthanded swing and overall offensive profile. 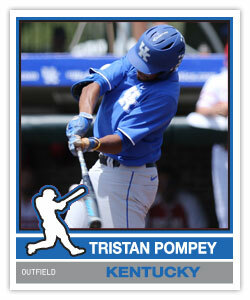 The strides Tristan Pompey made from his freshman to sophomore seasons were spectacular, and if he can just replicate last year’s numbers, let alone improve upon them, he could walk away with some big accolades at the end of the year. Highly athletic and full of quick-twitch muscle, the Kentucky center fielder more than looks the part at 6-foot-4, 205-pounds, and his overall profile, along with the production, has helped put his name into first round discussion. Despite playing in the strongest of leagues that is the SEC, Pompey managed to put up a stat line straight out of a video game as he hit .361-10-45, all numbers that ranked near the top of the Wildcats offense. The spotlight will shine even brighter on Pompey this coming season as he’ll be asked to assume an even greater leadership role with a team that enters the season with greater expectations. 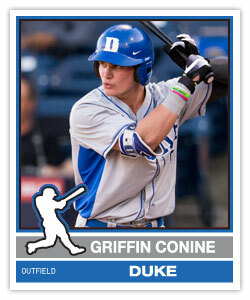 Baseball runs in Conine’s genes as his father Jeff spent 17 seasons in the big leagues and Griffin has done nothing but elevate his game since arriving at Duke. Now regarded as one of the more dangerous impact bats in all of college baseball, the lefthanded hitting Conine played sparingly as a freshman before giving us all a taste of what was to come by slugging 16 homers in the Northwoods League that summer. As a sophomore Conine hit .298-13-56 and didn’t slow down while on the Cape, showing an array of tools that focused around easy plus power that plays to all parts of the field with an advanced overall approach. He has all the makings of a power hitting right fielder at the next level and should be a top-half-of-the-first round talent who could force his way into the Golden Spikes conversation. Not surprisingly power is the name of the game for the hulking 6-foot-4, 265-pound Baker, who arrived in Fort Worth as a promising two-way prospect who threw low-90s bowling balls off the mound in addition to hitting tape measure shots at the plate. After making 10 starts as a freshman (with a 1.70 ERA), he has since given up pitching, and helped power TCU to their third consecutive trip to the College World Series in 2016 with a handful of key blasts during his Freshman All-American season. 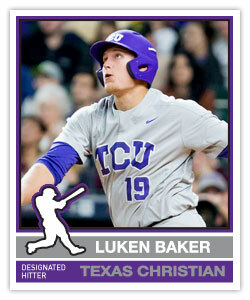 A Perfect Game All-American in 2014, Baker hit .317 in 47 games a year ago with eight home runs and 41 RBI, down from the .379-11-62 season he posted as a freshman. Keeping Baker healthy for his junior year will be key for TCU this coming season, especially if they wish to continue their run on Omaha. 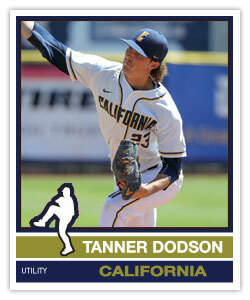 While Dodson is likely to continue his professional career on the mound, there’s no denying his talents all over the diamond, whether it be as a pitcher or as a righthanded hitting outfielder. After hitting .299 during his sophomore season, Dodson truly put his two-way abilities and switch-hitting profile on display during his time on the Cape last summer as he led the league in hitting with a .365 average. On the mound Dodson lives comfortably in the low-90s with the ability to ramp up his velocity into the mid-90s while mixing and manipulating his breaking ball for strikes. Dodson’s talent and athleticism are clear as he’s not only a two-way talent but one who excels on both sides of the ball and he enters the 2018 season as one of the favorites to win college baseball’s John Olerud Award. 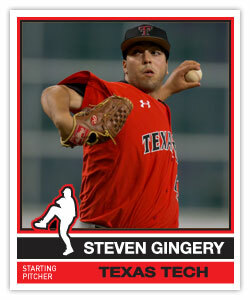 One of the statistically dominant pitchers of the 2017 season, Gingery went 10-1 with a 1.58 ERA as a sophomore, allowing just 60 base hits and 29 walks while fanning 107 in 91 1/3 innings of work. It takes far more than smoke and mirrors for the lefthanded Gingery to record outs, with the ability to spot his upper-80s to low-90s fastball on all four corners while changing speeds with a solid three-pitch arsenal that he throws for strikes. He has drawn comparison to former Gonzaga southpaw and changeup specialist Marco Gonzales, and like Gonzales, Gingery’s low floor sum-of-his-parts profile could lead to him being selected in the first round of this year’s draft. He leads a strong Texas Tech pitching staff, and overall team, that looks to get back to Omaha after their 2017 season rudely came to a close at home in Lubbock in Regional play. Singer’s former teammate, Alex Faedo, might have been the Most Oustanding Player of the 2017 College World Series but Singer was just as impressive in Omaha, striking out nine Louisville Cardinals in seven innings of a 5-1 win and another 12 Tigers in the team’s 4-3 win over LSU in Game 1 of the CWS Finals. Singer is now poised to lead the Gators in 2018 as the team’s staff ace, with a still-projectable 6-foot-5 frame and the stuff to match both his stature and his results. Armed with a low- to mid-90s fastball, the command and late movement on Singer’s fastball are more impressive than its velocity, and he also fires both a breaking ball and a changeup that continue to improve. He enters the 2018 season as one of the favorites for national pitcher of the year honors after striking out 129 in 126 innings as a sophomore. 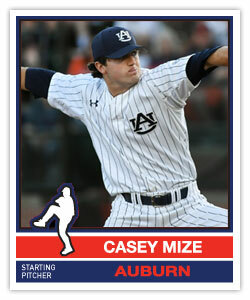 Mize entered his sophomore season in 2017 with some questions about his future role and whether or not he fit best long-term as a power-armed closer as opposed to live-armed starter. He answered those questions with a dominant season serving as one of Auburn’s weekend starters, not to mention one of the best starting pitchers in the SEC, going 8-2 with a 2.04 ERA, striking out 109 and walking just nine in 83 2/3 innings. The strikeouts aren’t surprising given his power fastball that he throws regularly in the 93-95 mph range that peaks as high as 97, not to mention his signature 85-88 mph splitter that serves as his change-of-pace pitch along with his mid-80s slider. Mize followed up his dominant spring with an impressive albeit brief appearance with Team USA, showing the best pure stuff on the staff as well as his uncanny ability to harness his power arsenal. 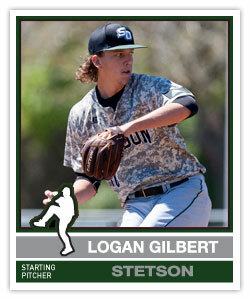 He may not pitch in a Power 5 conference but righthander Logan Gilbert has shown that his big arsenal plays at any level and that’s part of the reason he’s regarded so highly for the 2018 MLB Draft with a chance to be selected among the top 10 overall picks. Still projectable with a long and loose 6-foot-6 frame, Gilbert shows a knack for pounding the strike zone, speaking to his athleticism and ability to repeat his mechanics despite his long-levered frame. The velocity comes easy for the Stetson ace as he’ll sit in the mid-90s and can touch higher, maintaining his velocity while hitting his spots and missing bats. Last spring as a sophomore the talented Gilbert punched out 107 in 89 innings while walking just 26 and in the process went 10-0 with a 2.02 ERA, claiming the Atlantic Sun’s Pitcher of the Year award. The type of summer Ryan Rolison put together on the Cape does nothing but provide optimism for the Rebels, who are poised to open the season as one of the nation’s top teams. After beginning last season in the bullpen before transitioning into a starting role, the draft-eligible sophomore will take the reins of the rotation from day one with command of an arsenal that has him ranked near the top of draft boards. 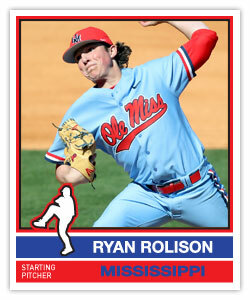 With polished mechanics and command for a breaking ball that projects to be a consistent plus pitch, the lefthanded Rolison has continued to see an uptick in his velocity as well, bumping as high as 95 mph without sacrificing any strike throwing ability. He finished last spring on a high note, with a near 3-to-1 strikeout-to-walk ratio and showed more of the same during the summer. 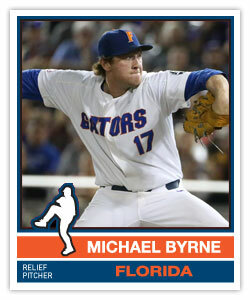 Byrne has a starter’s repertoire, with the ability to throw four pitches for strikes, including a low-90s fastball that he does well to spot at the knees on a consistent basis. That allows Byrne to throw more than just a single frame to close out a game as he finished fourth on the team with 75 2/3 innings. He also set a Florida single season record with 19 saves, with the final three of those coming in Omaha, an especially impressive feat considering he hadn’t even taken over as the team’s closer until their series against Tennessee in early April. Even then the early results weren’t promising, as he went 0-2 with a save in the three games against the Volunteers, but from that point forward Byrne, and the rest of the Gators, started to click on all cylinders, going 19-4 the rest of the way leading up to the postseason. 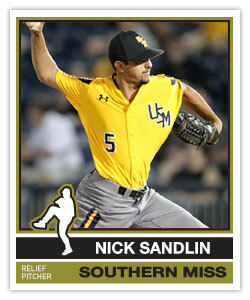 Although Sandlin may not match the other pitchers on the First Team when it comes to sheer velocity, few can match the success he has enjoyed the past two seasons serving as the closer at Southern Miss. He recorded 12 saves in 26 relief appearances in 2016 on his way to earning Freshman All-American honors, and saved another eight as a sophomore while going 10-2 in 29 appearances, striking out 80 in 56 2/3 innings. He does the most of his damage by filling up the strike zone with upper-80s to low-90s fastballs from a very low and deceptive nearly sidearm slot. His ability to shorten games by more than just an inning at a time allowed Southern Miss to go 50-16 in 2017, and serve as a Regional host, with even bigger expectations for the Eagles heading into 2018.